Spacious accommodations: A crewed catamaran offers wide, open spaces, including large, shaded cockpits, roomy salons, comfortable forward trampolines plus fly-bridge decks on many of our newer options. Stability under sail: These yachts provide superb stability while at anchor plus remain flat under sail, making a catamaran an ideal choice for first time charterers and family yacht charters. Ideal layouts: The layouts on these yachts typically provide 3 to 5 staterooms in separate areas of the yacht, providing guests with maximum privacy and comfort. Browse our catamarans below or learn more about our power catamaran options. If you have questions or are ready to book your charter, call us in our South Florida office at 954-980-9281, Toll Free at 888-670-6884, or complete our Quick Request Form. A few notes on charter.....the boat was perfect for our family....plenty of room, well appointed, and your recco on the flybridge was true - it made a big difference for us to spread out. The vacation was perfect for our family...boat, crew, location, experience....cannot wait until we book again! Thanks for all your assistance - as a first time catamaran experience, you certainly guided us to a top notch vacation! 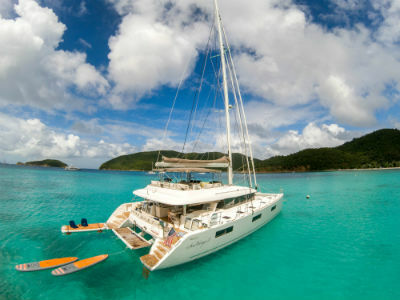 To sort catamarans, click on Size, Max Guests, Low Price or High Price at the top of the table.